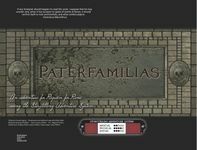 Paterfamilias is a new story in the Storytelling Adventure System for Requiem for Rome, a Vampire: The Requiem series. Containing a collection of scenes, Storyteller character records, a number of hyperlinks to various portions of the text as well as bookmarks, so you can always jump right to what you need with just a click. There's also a new hunter group provided, as well as errata for Requiem for Rome and Fall of the Camarilla.